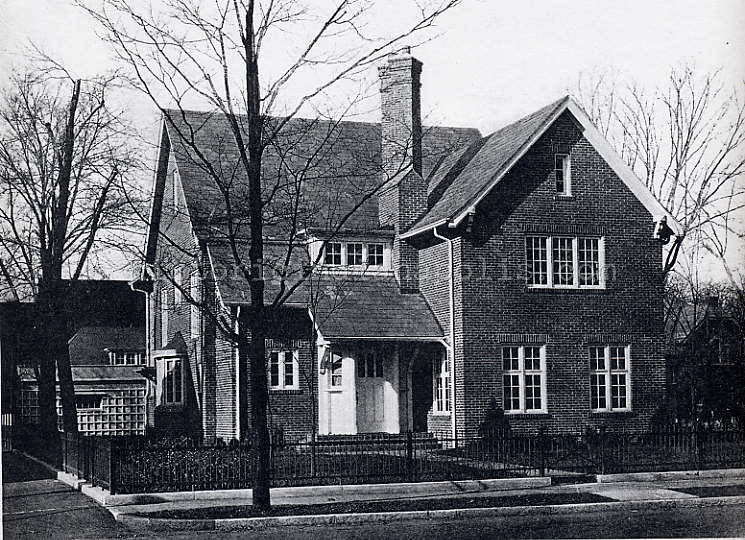 Despite efforts to the contrary, the Ambassador is standing after 93 years and firmly set on its original foundation. 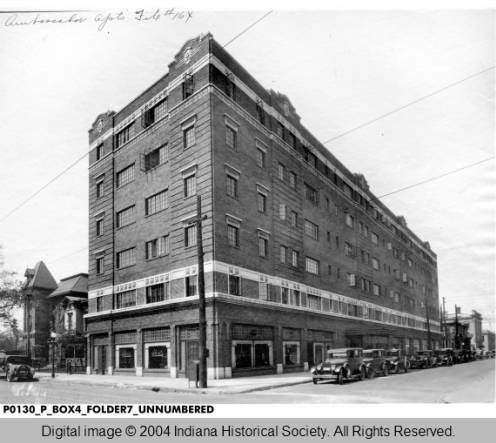 Sixteen years ago, planners, architects, preservationists, neighbors and members of the St. Joseph Historic Neighborhood Association debated proposals to raze or move the Ambassador Apartments at 9th and Pennsylvania Streets. The building stood in the way of plans for a 267,000-square-foot addition to the Marion County Public Library. 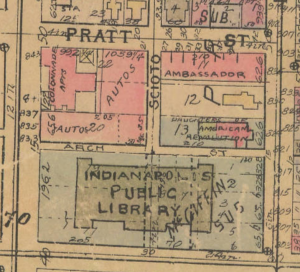 Not everyone was satisfied with the decision, but on July 19, 2001, library officials voted to modify blueprints for the $100 million expansion: The Ambassador would not be torn down, and it would not be moved, as proposed, one-half block west and across the street to the northeast corner of Meridian and 9th–a move carrying a $3 million price tag. But its parking lot, immediately west of the building, would be replaced by a rear entrance to the library and a drive through for dropping off books. Having adequate space for the expansion wasn’t the only problem facing developers, however. Stakeholders knew that residents of the Ambassador would not be content with all the noise and inconvenience of a protracted building project next door. The library solved that by buying the Ambassador . 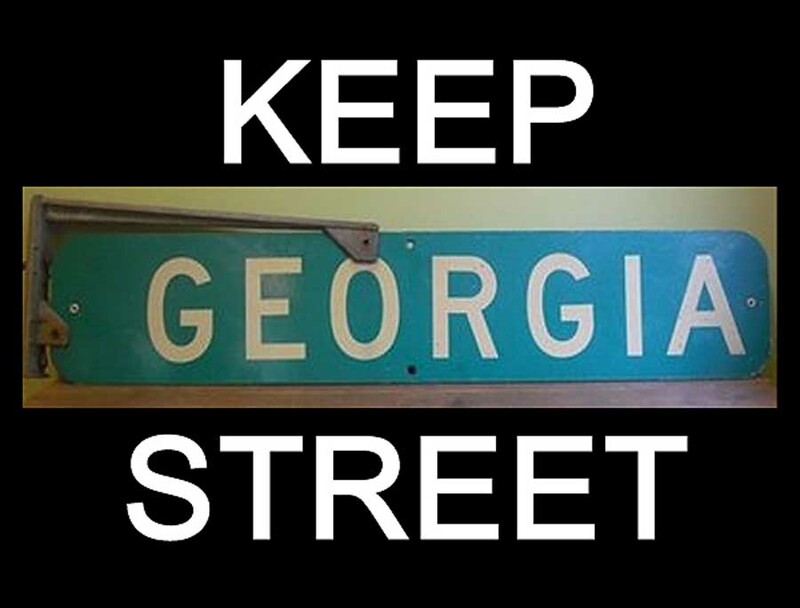 . . and vacating it for the period of construction. And when the library expansion project was complete a few years later, they sold the apartments to Buckingham Properties. 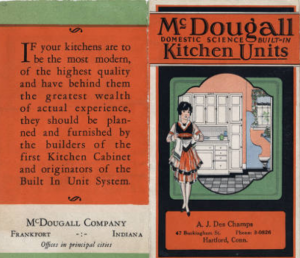 Unfortunately, some of the original features of the building were long gone. In the mid-1980s, the Ambassador was one of nine noted “Pennsylvania Place Apartments.” The other eight were The McKay, The Pennsylvania, The Van Dyke, The Dartmouth, The Raleigh, The Spink, The Plaza, and the Harness Factory Lofts. All were being renovated by Edwards Development Corporation, a St. Louis firm investing $18.2 million to add 415 new units to downtown’s apartment mix. While the company had preserved the historical features of the building’s exteriors, the interiors were replaced with modern amenities. Hardwood floors were covered with carpet and brick walls were covered with drywall. 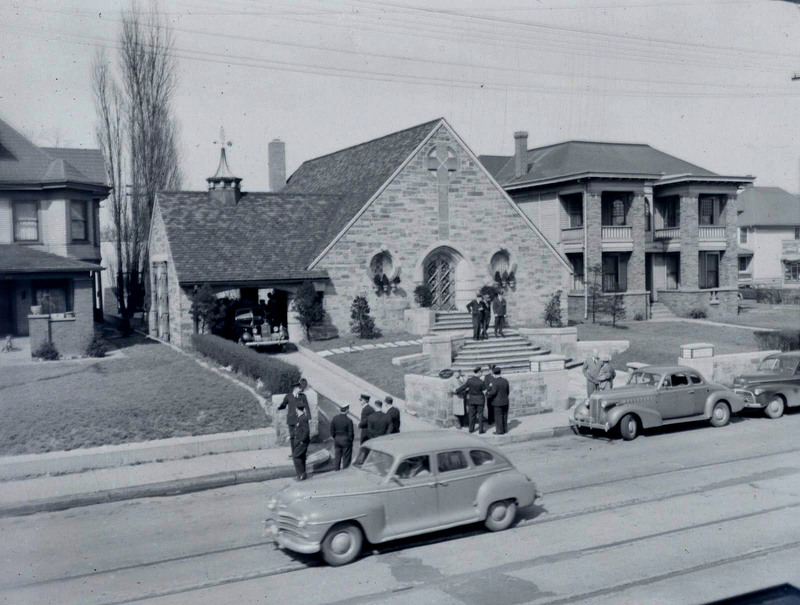 Officials at Edwards defended the renovations as a practical necessity, while detractors said the changes had stripped the building of historical character. Some of the historic features were restored with the 2008 acquisition. 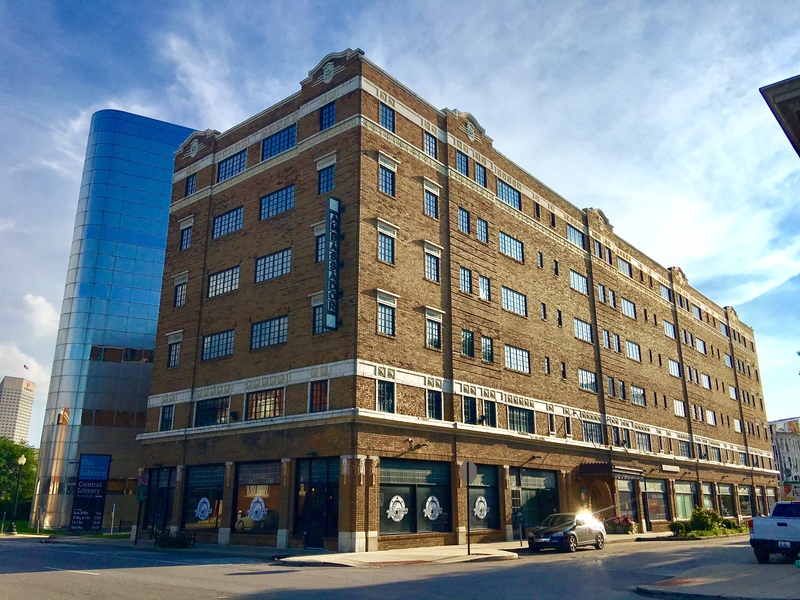 The Ambassador currently offers one-bedroom apartment units and amenities that include a fitness center, media center, hardwood floors, exposed brick, historic architectural features in the lobby, and a welcome mat for cats and dogs. Meanwhile, renters’ cars, once very much at home in the lot next door where the library now sits, must park in surface lots across the street. 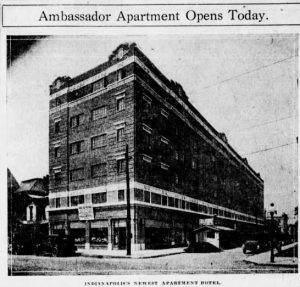 Photo appearing with a newspaper account of the opening of the Ambassador Apartments. Source: Indianapolis Star, June 15, 1924. The Ambassador is anchored on the ground floor by an interior design firm and a restaurant facing the corner of 9th and Pennsylvania. Plow & Anchor ended a two-year run there in January 2017, largely due to lack of guaranteed parking for its customers. The space is now occupied by a taco eatery. Nearby the Ambassador is experiencing something of a renaissance. Apartment living paired with retail and other business ventures of a creative nature seem to be on the rise. Prominent among new additions to the area is Pat McAfee’s Barstool Heartland, the headquarters for his new comedy sports web site. 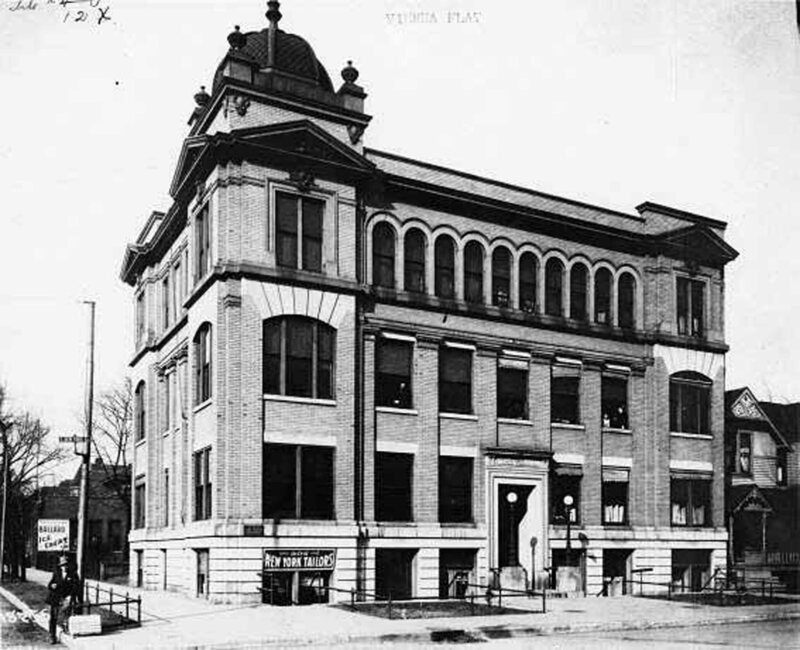 It is slated to open this month in a nearly 100-year-old building at 935 N. Meridian Street. Just to the south, new apartments are under construction on the land that had been proposed as the site to relocate the Ambassador. Rudy Schouten is a former corporate marketing services manager now providing personal and commercial writing services--sales institutional and biographical content--on a freelance basis.